We celebrated my husband’s birthday on Wednesday. It was a nice, low-key evening at home. I showed him my dessert board on Pinterest, and he requested that I make this cupcake recipe by Kevin & Amanda (the former being his namesake!). 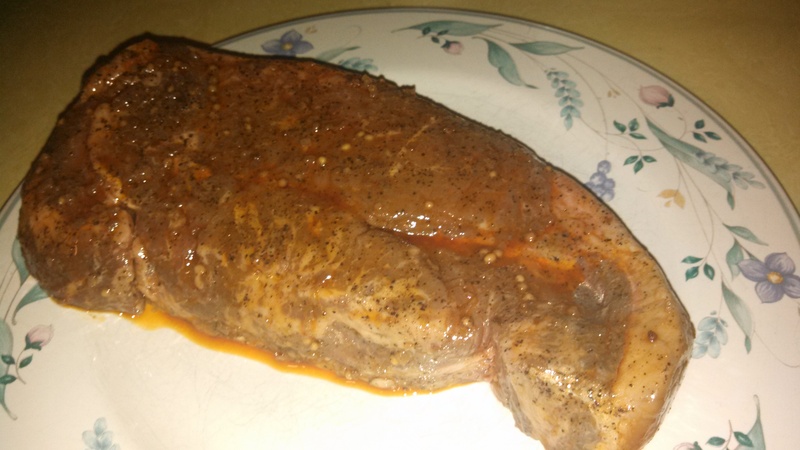 He also requested to grill a large sirloin steak as his birthday meal. 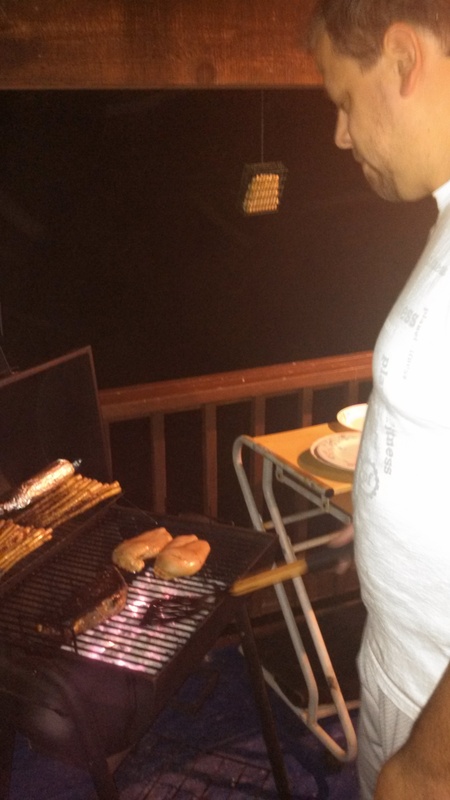 He got the steak (him) and chicken (me) from The Meat House (which apparently has locations in several states). The portions were so large that we had two days worth of leftovers! But I will say, this might have been the juiciest and most moist (moistest?) 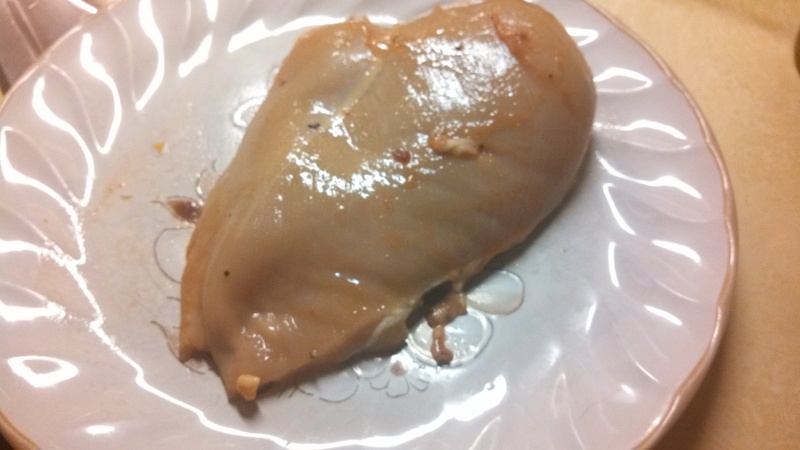 chicken breast I have ever eaten (that’s what she said, I know, I know). Anyway, onto these cupcakes. They were so good, but I ran into a few issues while making them. First of all, as you can see by the pictures, they spilled over the top of the pan a lot. I realize that baked goods rise in the oven, I just did not realize that they would rise quite that much. Second, it all looked done (and I did the toothpick trick), but after 5 minutes of being cooled, I glanced over, and they had complete sunk in the middle…of each one. I blame this on the brownie bite…maybe it wasn’t cooked enough? I don’t know. My mother-in-law suggested putting a scoop of vanilla ice cream in the middle of each one. I just decided to fill them up with extra frosting. 😉 But vanilla ice cream is definitely a good idea, too, I just didn’t have any. 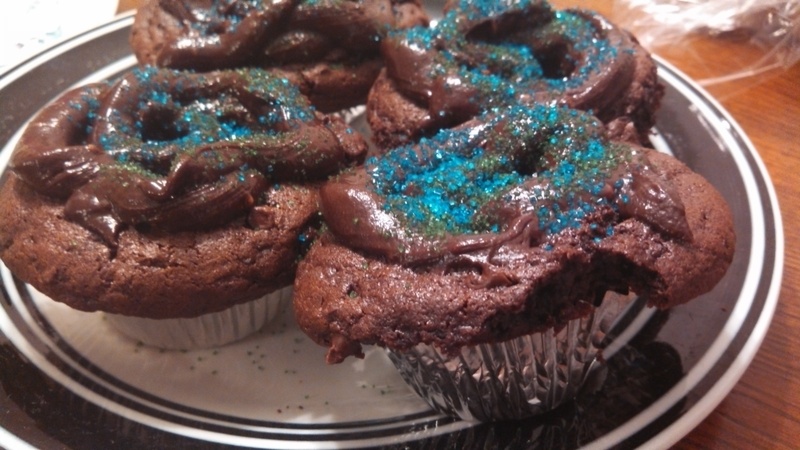 I did, however, add blue and green sprinkles to the finished product! In any case, despite the rising (and then falling) of each cupcake, they were still so amazingly decadent. I mean, let’s consider just how much butter went into this. And chocolate chips…lots and lots of chocolate chips (side note: I’ve never melted chocolate chips in the microwave before…it definitely beat store-bought frosting!). BUT my husband and I decided it is healthy. -For the brownie bites, combine all brownie batter ingredients in a large bowl and mix on medium speed for 2 minutes, or until well combined. 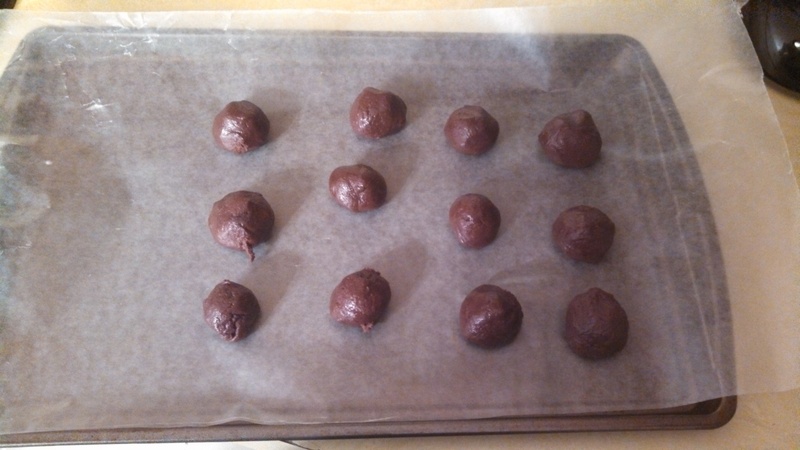 Using a small scoop (about 1.5tbsp) drop batter onto a baking sheet lined with parchment paper and freeze overnight. -For the cupcakes, preheat your oven to 325 degrees. Spray a muffin tin with cooking spray and line with cupcake liners. -Combine all cupcake ingredients, except chocolate chips, into a very large bowl and mix on medium speed for 2 minutes, or until well combined. Stir in chocolate chips. 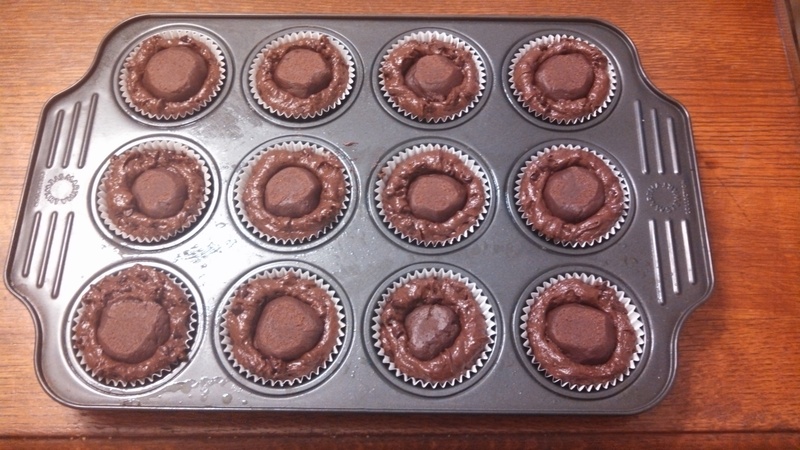 -Using a large scoop (about 3tbsp) drop batter into the cupcake liners, filling about two thirds full. 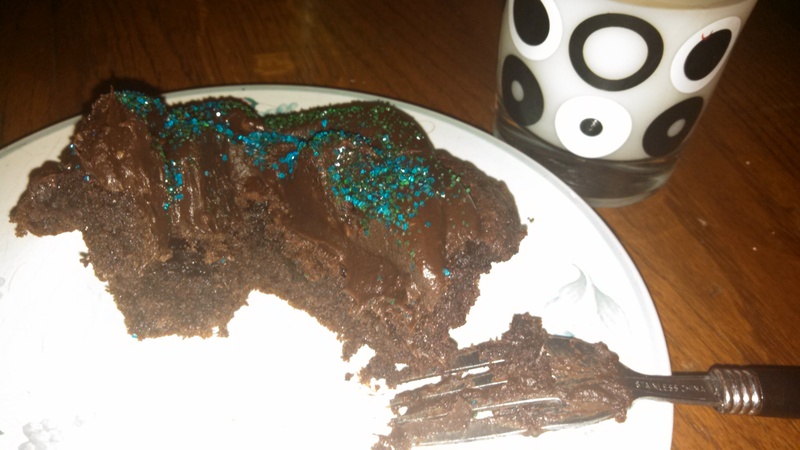 -Remove brownie batter from freezer and press into the cupcake batter. -Bake for 22-28 minutes. Allow to cool completely before frosting. -For the frosting, melt chocolate chips in the microwave, stirring well every 30 seconds, then allow to cool for 5-10 mins. -Combine butter, sugar, cocoa and salt in a food processor and process until smooth, about 30 seconds. Scrape the bowl as needed. Add the corn syrup and vanilla and process until just combined, about 5-10 seconds. Scrape the bowl again, then add the melted chocolate and pulse until smooth and creamy, about 10-15 seconds (I just used a spatula, and it worked really well). 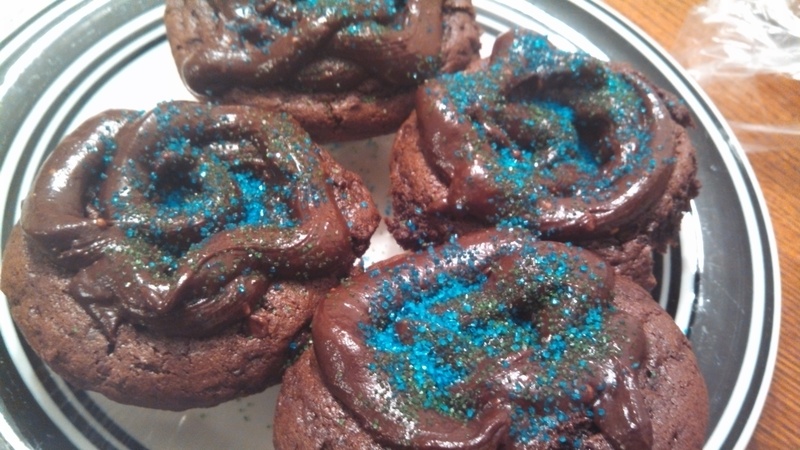 -Put the frosting into a Ziploc bag, snip a small amount off the edge, and pipe the frosting onto the cupcakes.